Presidential hopeful Robert Francis O'Rourke denounced Israeli Prime Minister Benjamin Netanyahu's pledge to annex settlements in the West Bank, calling the Israeli Prime Minister a "racist" after a Sunday campaign speech in Iowa. According to O'Rourke, annexing parts of the West Bank "will make peace in the long term impossible" between Israel and Palestinian factions, the Washington Post reported. O'Rourke instead advocated for a two-state solution and said that Netanyahu has sown division throughout Israel, because he has "joined forces with far-right parties who are inherently racist in their speech and the way that they want to treat their fellow human beings in that part of the world." O'Rourke clarified his comments after the speech, telling reporters that the prime minister himself is a "racist." O'Rourke also criticized President Donald Trump for his close ties to Netanyahu, following American recognition of Jerusalem as the capital of Israel as well as American recognition of the Golan Heights as Israeli territory. "If we truly care about the safety and the human dignity of every person in that region, Israeli or Palestinian, then we have to have a two-state solution," O'Rourke said. "But that opportunity is quickly fading in the face of our inaction and some of what this administration has done to exacerbate some of the preexisting condition." O'Rourke's comments came a day after Trump delivered a speech at the Republican Jewish Coalition in Las Vegas, in which the President said that Democrats are "advancing by far the most extreme, anti-Semitic agenda in history." 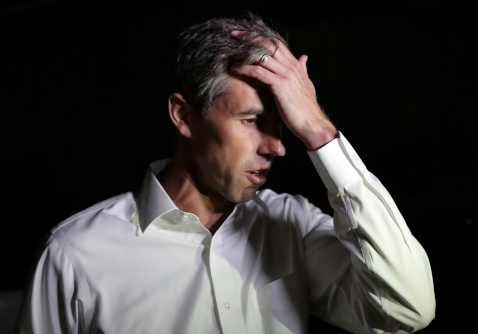 O'Rourke is among the many Democratic 2020 candidates who did not attend the American Israel Public Affairs Committee's annual Policy Conference, following calls from the liberal group MoveOn to candidates to boycott the pro-Israel conference. Other candidates not attending the conference included Sen. Kamala Harris (D., Calif.) and Elizabeth Warren (D., Mass.). This entry was posted in Politics and tagged 2020 Election, Anti-Semitism, Benjamin Netanyahu, Beto O'Rourke. Bookmark the permalink.